Sharana has almost completed its Seeds of Change activities on Waste Management in the Bharati Government Higher Secondary School in Bahour. 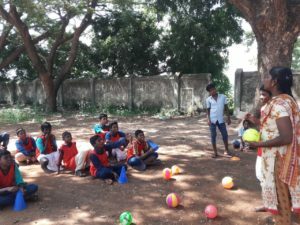 Our social workers have been working with this school since October 2017, conducting weekly sessions to create awareness through sports and games with 30 children from the 7th and 8th standards (ages 12-13). We were reached out to work in this school through the office of our Honorable Lieutenant Governor Dr Kiran Bedi, and have received good support and enthusiasm towards our team and project from both the management as well as the children themselves! Unfortunately, it is a common practice in our country to dump waste in the streets. However, our children can change this; after all, they are the adults of tomorrow and the future of the country. They need to understand that there are two main kind of waste (organic and non-organic waste) and that the problem of waste management largely concerns that of non-organic waste. Whether it is buried into the soil, discarded in our nature, or burnt, it has harmful consequences for our environment. This in turn negatively impacts each and everybody’s lives. Therefore we should try and stop using non-organic materials, and find efficient collection systems to sort and recycle any non-organic waste we do create. A couple of weeks ago, the children participated in two games, designed to create awareness around the subject of waste recycling. The first of these was the “3R” game, which teaches them about Reducing, Reusing and Recycling and why eco-friendly behaviours are crucial for building a bright future for everyone. The week after, the children enjoyed the Hitcyle game – the objective of this game was to make the children remember which products to use and which not to in connection with waste sorting and management. The weekly activities of Seeds of Change are based on three steps. 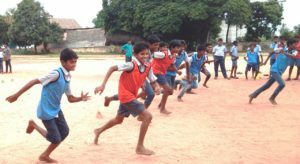 First the children play a sports game – this initial step is mostly for fun and to build the children’s confidence to participate. Then they play the same game again, but this time, the vocabulary is changed to incorporate an awareness issue (for example during “3R” the balls becomes tomatoes and the cones become either cloth or plastic carrying bags). 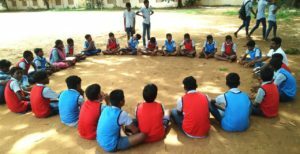 After each game session, the social workers facilitate a group discussion, encouraging the children to think about the situations created in the game. 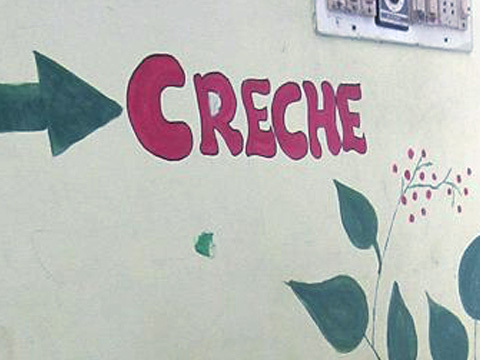 During this final step, the children are given a chance to voice their opinions and experiences. This last stage is crucial to ensuring the messages have not only been understood, but that the children feel ready to change their behaviours and spread awareness in their communities. A lot of students from other classes observe the game sessions and interest builds. This sparks conversations on the topics between those involved and those watching. Thus, the messages tend to be spread organically as the children share what they have learnt with their intrigued peers. 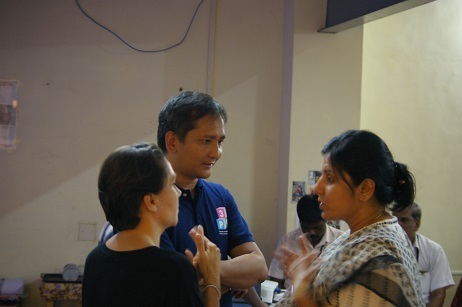 They are also encouraged to speak about the subjects at home and in their community. Therefore, the children act as key change agents, spreading sessions impact through their school, families and communities. 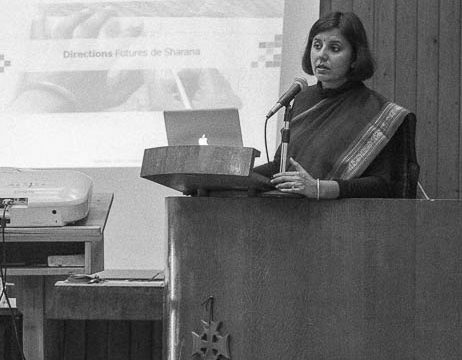 During the coming weeks, Sharana will complete the program on waste management in this school and start to prepare an impact assessment of the program with the children, the headmaster and other school personnel. 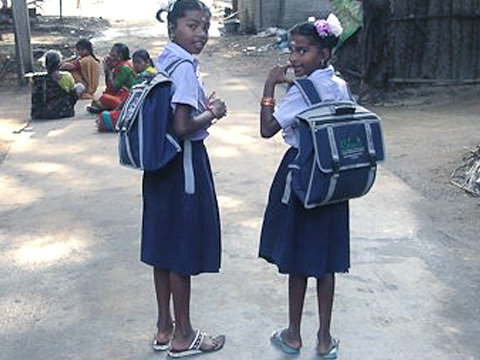 -post conceived by volunteer Ferdinand and social worker Anbu.